Delight Your Guests and Simplify Your Day! Delighting your guests is your highest priority. Yet so much of their time is spent beyond the comfortable confines of your lodgings that it’s natural to wish you could be more influential in making their stay one that they remember and recommend among their social circle. Fortunately, guests trust you to recommend the best places to eat, play, shop and enjoy local experiences, creating a big opportunity to make their stay memorable. But since you can’t be available 24/7 and they may need your guidance at any time or place, you need some help in providing them with information that goes well beyond the limitations of paper lists and maps. 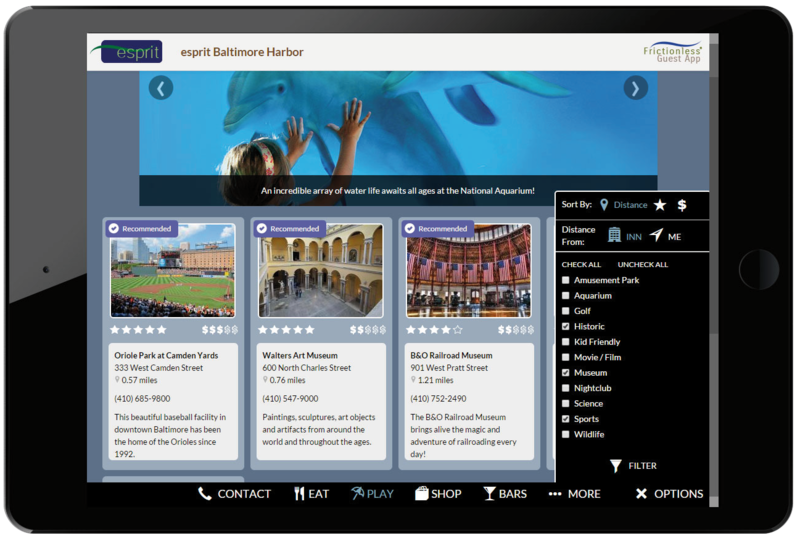 Guests only see your exclusive content for experiences, offers, etc. Guests can call directly from the app for assistance, reservations, etc. Guests only see your exclusive content — unique descriptions of every local place you recommend so they can make informed choices during their stay. Pamper them with exclusive offers and the ability to call directly from the app so they can get immediate assistance, make reservations, etc. Guests only see your local recommendations, which are easily searched by categories you assign and can be sorted by your quality or price rating, as well as distance from your property or your guest’s location. they can access from any mobile device. If your property has 5 rooms or less, you get full use of the Frictionless Guest App at a cost of $19 per month. If you have more than 5 rooms, you pay the base amount of $19 + $1 per month for the number of rooms over 5. Pay monthly and cancel at any time. Monthly cost discounts are available if you choose to pay in advance. Want to learn more about the Frictionless Guest App? Please complete our form and we will reach out to you!